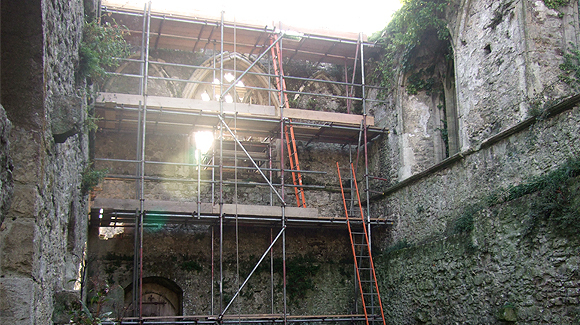 Our first step in the conservation of Saltwood Castle was a sensitive assessment of it’s history and merits. 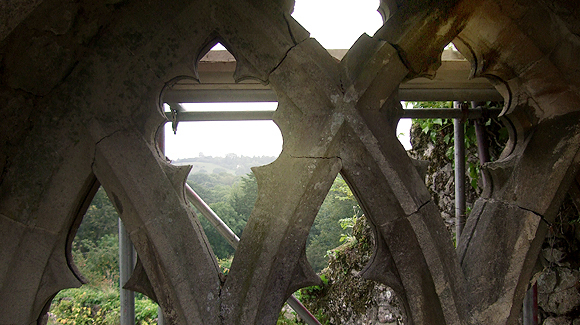 While promoting the use of traditional materials and skills we keep up with current technical issues and regulations which can have both positive and negative implications when applied to this important Grade 1 listed monument. We place a high premium on the retention of all historic fabric through conservation, maintenance and repair. Thorough measured survey with a tape, rod and level. Modern measuring techniques, such as photogrammetry (the use of aerial photographs to make maps and surveys) and a Geophysical report, have been used to increase accuracy. Once the measurement was completed, there was analysis of the structural stability of the building and its living pattern of movement. We work closely with Historic England, architects, surveyors, planners, buildings archaeologists, structural engineers, conservation officers, builders, craftspeople and other building conservation professionals, to ensure that this important scheduled ancient Grade 1 listed monument is preserved for future generations. We use industry standard moisture meters, and other detection systems – dehumidifiers are emptied regularly, and a daily examination of the fabric of the building, leaking gutters, and water down pipes. High level clearing of leaves and detritus from gutters, and air vents. Careful monitoring of the castle and surrounding grounds by our experienced groundsmen, including farm stock, domestic animals and vermin.